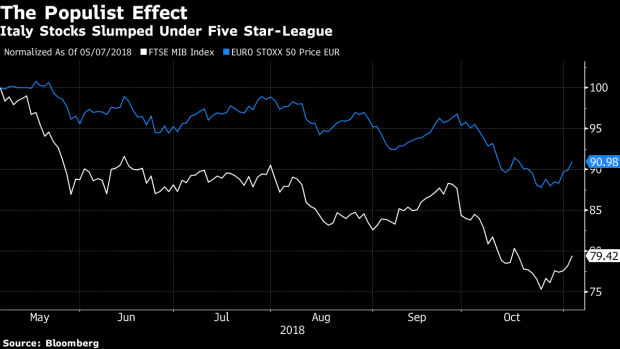 (Bloomberg) -- The honeymoon is over for Italy’s populist government and the country’s entrepreneurs, as business owners and managers in the prosperous north voice concern, and even anger, over policies and budget plans from the five month-old coalition. The influence of Five Star, which made its name by railing against the excesses of capitalism, has entrepreneurs ready to draw a line in the sand -- and demand that the League stand up to its partner. While the League continues to surge in opinion polls -- it’s now Italy’s top party based on the most recent data -- an index of confidence in the coalition led by Prime Minister Giuseppe Conte fell to a record low in November, according to an SWG poll for TG LA7. “Adesso Basta,” a Turin business group whose name translates roughly as “Enough Already,” has called for a mass march Nov. 10 to protest. “Unsustainable, paradoxical, absurd and dangerous," the organization’s leader Corrado Alberto said in describing the government’s current direction.